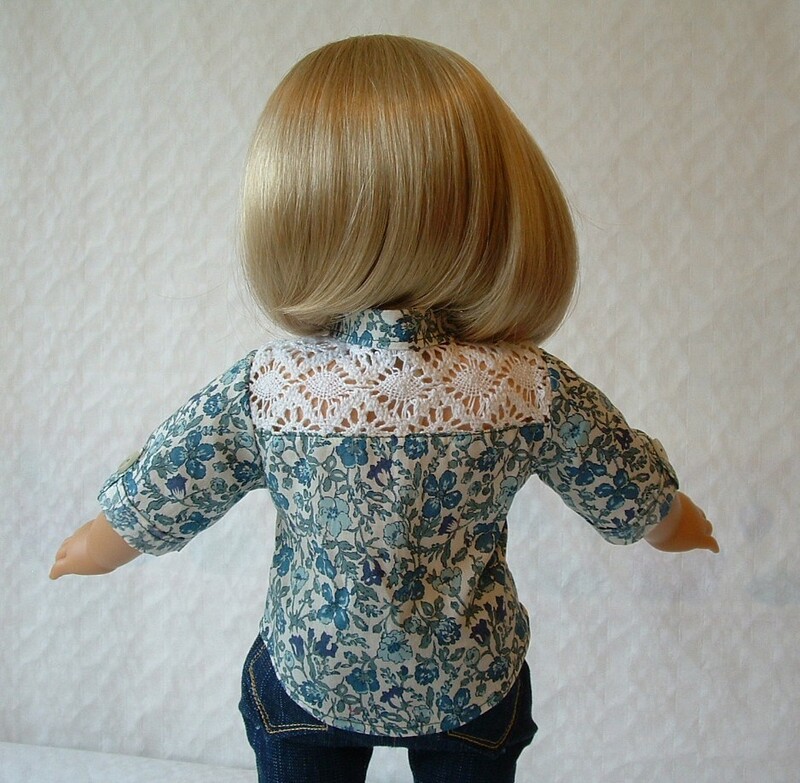 Kit loves her button-up shirt with its lace yoke. Liberty Jane Clothing recently advertised their Button-Up Shirt as being ideal for Autumn (Fall) wear, so Kit felt it was time to showcase Kit’s Couture’s interpretation of this very effective design. We chose another lovely piece of Tana Lawn for this shirt, this time in the attractive 1930s “Meadow” design in a dusty blue that matches Kit’s eyes to perfection. Once again we’re indebted to our friend Christine for providing us with the fabric remnant that is so flattering to Kit’s summer colouring. The lace yoke is cut from a wide piece of cotton lace braid. Six buttons and four poppers (snaps) complete the garment. This is a perfect miniature shirt, with a yoke, a placket onto which the buttons are mounted, and a collar stand onto which the collar is set. We chose to do the three-quarter sleeve option, which features turn-back cuffs fastened with buttoned tabs. I had never made a shirt before, so this was all new territory for me. Perfectly aligned pattern on the yoke back. The first challenge was cutting out. I smiled at the pattern instructions which showed layouts for cutting out which looked just like those you would get with a full-sized pattern. This was a seriously authentic shirt! I studied the pattern pieces carefully to be sure how the lace yoke would fit against the shirt fronts, then with great care I placed the pieces and cut them out. I had not been able to find a fine lace wide enough to accommodate the yoke pattern pieces, so had gone with the cotton lace braid. In cutting out I made sure that each front yoke’s lacy pattern was a reflection of the other, and that the back yoke was centred horizontally and vertically over the wide diamond pattern. The lace was lovely, but it was rather thick and bulky to work with against the much finer lawn fabric. I used Fray-Check to stop its open weave from unravelling, and did the best I could to make the crisp points required on the front of the yoke. The next tricky step was the placket. I followed the excellent instructions carefully, and was very grateful for my blind hem foot which made it possible for me to edge-stitch the placket evenly and within a gnat’s breath of the fabric edge (without wobbling!). The collar was fiddly both because it was so small, and because the collar stand had to be stitched to the lace yoke, whose loose open weave was not as stable as a plain woven fabric would be. 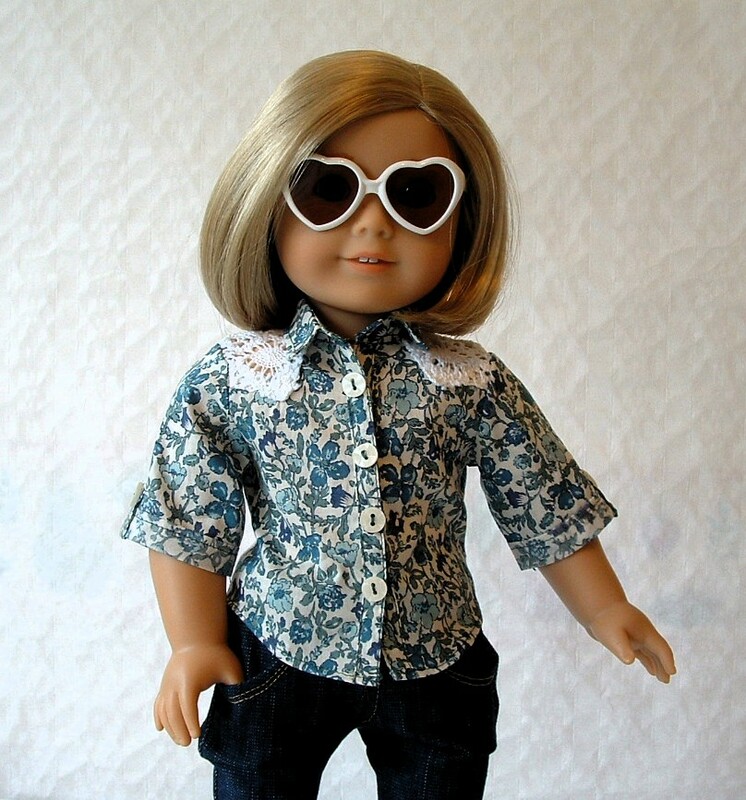 It just required that extra bit of care to construct, and again, I was so grateful to the excellent clear instructions provided by Liberty Jane Clothing as step by step I created an authentic shirt in miniature. Three-quarter sleeves finished with tabbed cuffs for that authentic look. The three-quarter sleeves are hemmed to look as if the sleeve is turned back and fastened with a buttoned tab, with the underside of the fabric showing. This is purely decorative but very effective. Here top-stitching is on show and it has to be absolutely even, so out came my blind hem foot again. Top stitching holds no fears for me now. Last part of the construction was hemming the curved tails of the shirt, and then all that remained was to sew poppers onto the button placket and place the buttons here and onto the tabs on the cuffs. A perfect fit, and great with Liberty Jane jeans. 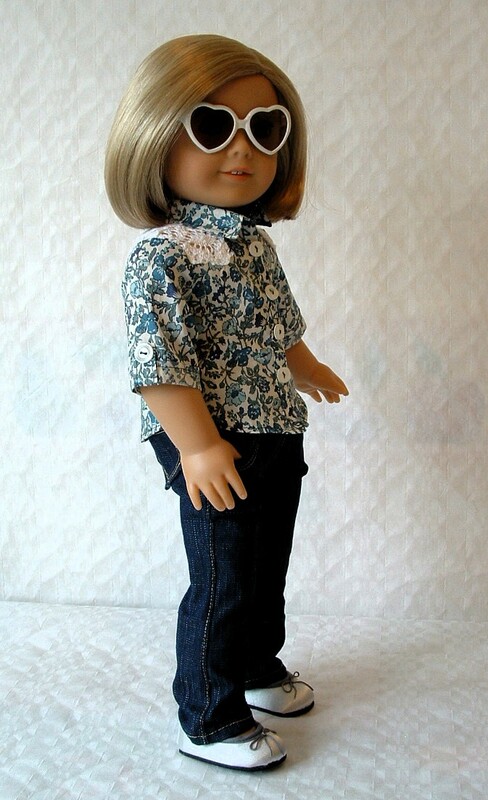 This really is the favourite garment that I’ve made so far in American Girl size, a perfect miniature shirt in every way. It’s a versatile pattern too, with a long-sleeved version, and of course it can be made up with a normal fabric yoke for a more everyday look. 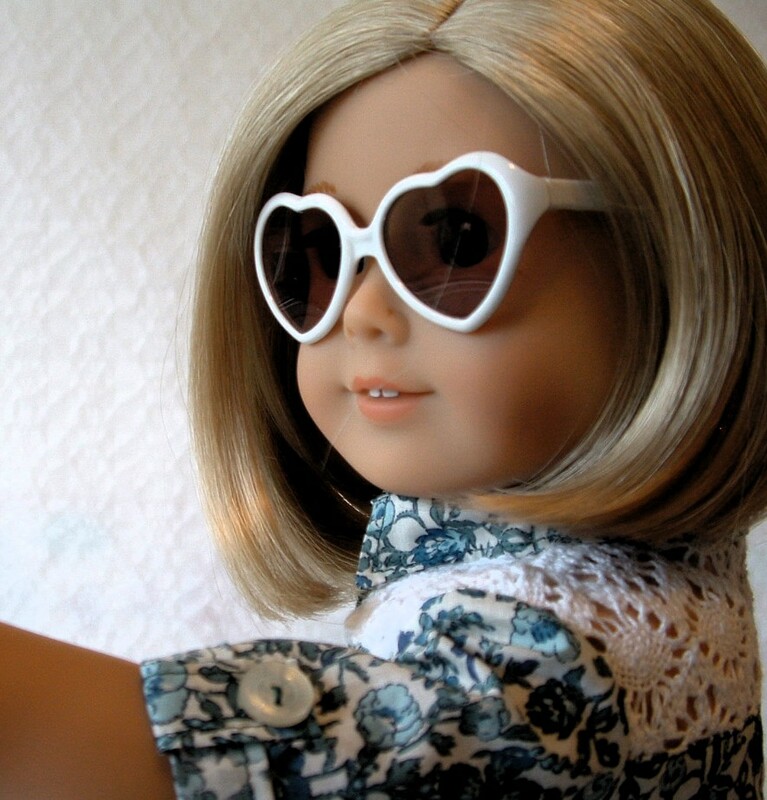 But the lace yoke is the most original touch, and Kit loves wearing it with her Liberty Jane jeans and her silver ballet flats from Sophia’s, plus her oversized heart-shaped Gotz sunglasses. Just perfect wear for golden afternoons of late autumn sunshine.